Just before Xmas Tom moved into a flat closer to his work. This seemingly innocent move put in place a train of events that involved some sensitive discussion as interested parties maneuvered to mutually beneficial outcomes. As a result of these negotiations, the garage has returned to its role as a place to park a car, the outside shed a place for garden tools (rather than boxes of terrain) and my wargaming room (off the garage) to a general storage room [95% wargaming stuff 😀). To offset that I have a room up in the main part of the house purely for gaming. 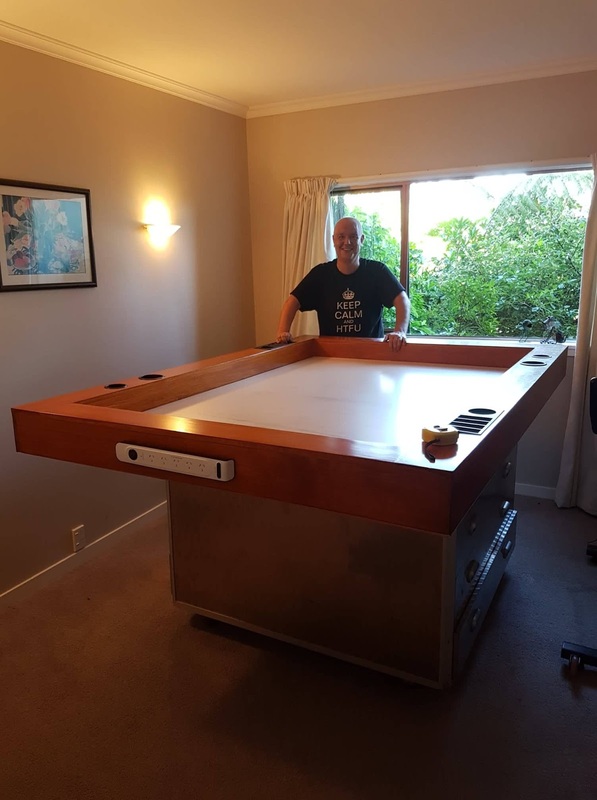 I called up Hagen one afternoon and he came around to help me move my gaming table. Easier said than done! The table sits on an old Games Workshop table and this was too large to get through our doorways (as well as weighing a tonne). So it had to be dismantled and reassembled once inside the room. The cabinet holds my armies and there is space at either end for 8x 92L boxes of terrain. The room has built in cupboards for further wargaming storage. It is really well lit and you can get 360 degree access meaning that it is now easier to play Hammer & Anvil deployments. The last two weeks higgins has been around and spanked tmy Harlequins both evenings. Looking forward to have more locals over for games during the coming years. Looks great dude, top effort ! Rather disappointed I'm not a local. :-) Looks really nice mate. You look very pleased, and well deserved. Can imagine you and Hagen had lots of fun moving that.